Hemprich’s Hornbill is huge dark brown bird, with a massive dark red bill. The breast is dark, with a white-belly and the outer tailed rectrices is white. 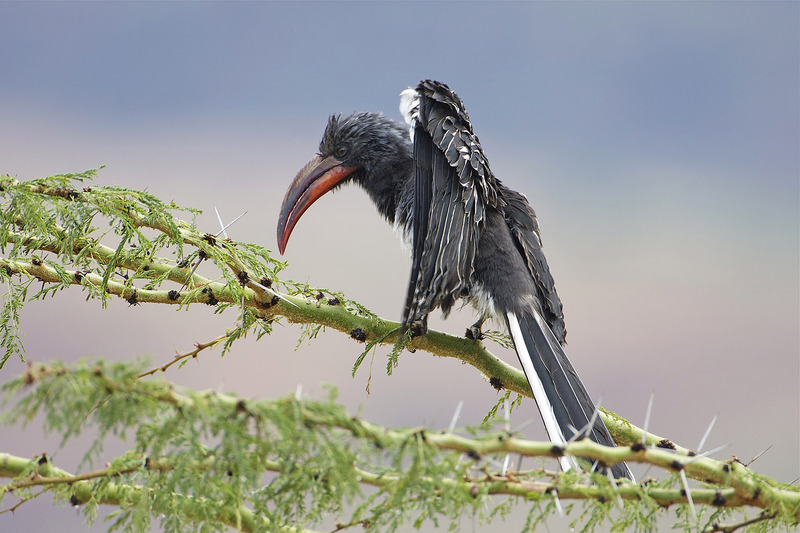 In Kenya, this bird is sparsely distributed in rocky hillsides and cliffs in arid and semi-arid country with records from Lake Nakuru around Menegai crater, Lake Baringo, West Lake Turkana, Ortum and Kongolei escarpment. Dark chestnut brown bird with red beak, black tail, and deep purplish blue rump. Male has purplish-blue feathers around the eyes, and purplish-blue breast, belly, and flanks. Female has less extensive (sometimes absent) blue feathering on the face, and often has white feathers around the eyes; female’s breast and belly is spotted or barred white. Juveniles appear similar to the female but paler, duller, and without white markings. The juvenile tends to be paler. Juveniles have blackish bills and their legs are paler than the adults’. Juveniles go through an early partial molt of the face feathers where males obtain their blue feathering and females their pale mauve feathering around the eyes. This is a dimorphic species; the male sports blue on his face, breast, and belly. The female has less extensive blue on the face and sports white around the eyes as well as on the breast and belly. Usually form pairs and small parties. Courtship usually takes place on the ground with the male holding a stem or feather in his bill, singing and bowing his head as he bobs up and down, hoping to attract a female. An interested female may fly to the male, twist her head and tail toward him and possibly also show a display. Both male and female share nest construction, often building their round nest low in a bush or shrub. The male may continually line the nest with feathers during incubation, which both parents take turns doing through the day, with the hen incubating at night. This species is widely distributed in Kenya and it should not be difficult to spot and identify this bird.